We are garden fairies and we have come to this blog on this evening when we could be enjoying a nearly full moon and temperatures that are not just too, too cold because we want to express alarm. As usual, it is up to us to keep track of what is really going on here at May Dreams Gardens and tell people because we can't really count on Carol for the whole story. 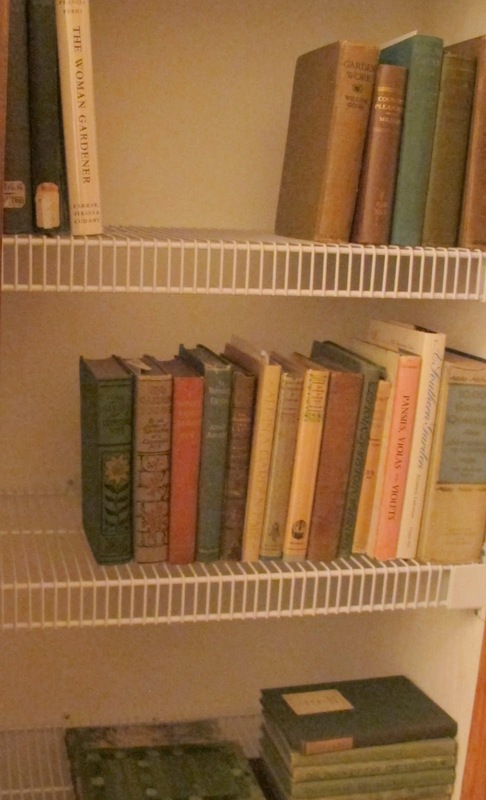 As evidence, may we present this closet of books. What is alarming about this, one might ask? Well, we are garden fairies and what is alarming about this is that this closet used to be full of linens and now it is half full of old gardening books. Seeing this picture would imply that perhaps Carol doesn't have very many gardening books or she doesn't have many linens. Well, we are garden fairies and we say "linen closets can be quite deceptive". We hope that no one is naive enough to think that this is the sum total of all the gardening books Carol has. We are garden fairies and Carol has more books than we garden fairies can count. That is a lot of books. There are floor to ceiling bookshelves, three of them, in her den and they are so full of books that books are stacked on top of the rows of books and more books are piled on the floor next to the shelves. 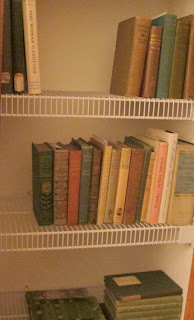 Then there is another bookcase in the great room and it is full of gardening books, too. Oh, and her coffee table has stacks of books on it, too. Not to mention, and here is where the alarm part comes in for us garden fairies. We are garden fairies and we didn't think too much of Carol ordering one gardening book for herself last weekend when she was doing some online ordering for Christmas presents. But then we noticed that through the week she managed to order 16 more old gardening books. These are not new books. These are old books. Most of them date from the 1910's! We are gardening fairies. We are alarmed and wonder what in the world could be in these old gardening books that causes Carol to order them up like that. We have many questions. What are these books? How long has she been searching for them? What is in them that made Carol order them? Who is Harriet Louise Keeler? What is Carol going to do with these books once she gets them? Perhaps what has us most alarmed is that we did not see this coming. We did not. We checked around and no one else around here thought this would happen, either. But it did. We are asking the ultimate question...what trigger went off in Carol's mind that caused her to order these books? If we find out that answer, we will become booksellers ourselves and become rich. Rich, we tell you. Viola Greenpea Maydreams formerly known as Thorn Goblinfly, chief scribe and head librarian at May Dreams Gardens. (Laughing)...The linen closet in our "library"/former bedroom is completely full! And not nearly so neat as yours! I will resist, however, any attempt to enroll me in a twelve-step Garden Books Anonymous chapter. Viola Greenpea, I can tell you that even her non-fairy friends were somewhat taken aback by the extent of her purchases! We're keeping a close eye on her! Garden Fairies, for humans there is no such thing as too many books especially when it comes to gardening!